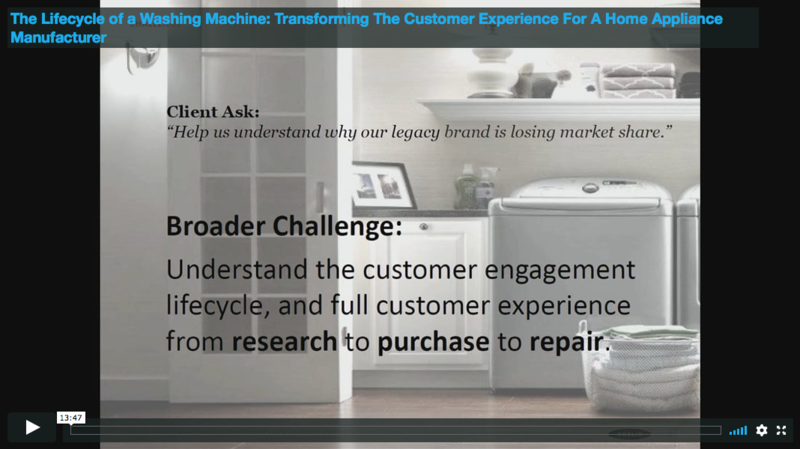 Case Study—This case study explores a customer experience transformation strategy and development research project run by Deloitte for a multinational U.S.-based home appliance manufacturing company. It explores the shift in strategy and approach for the company based on the team's digital ethnographic research, as well as applying the ethnographic method to a non-traditional data source (digital and social media). Part one lays out the background on the client and the team and challenge proposed by the client. Part two lays out the details of the team's methodology and process of evaluating social data using ethnographic and other qualitative and quantitative methods. Part three reflects on the findings of the research and how these differed substantially from the client's assumptions. Part four evaluates the contribution the digital-based research made in providing a new perspective on the enterprise's customer experience strategy and understanding of their customers. The evidence from the case study suggests that the value of analyzing the customer lifecycle and customer experience using digital and social media sources provides insight into how people make purchasing decisions, and uncover previously unidentified stakeholders that hold crucial power in the buyer-seller dynamic. The authors’ research methodology provided a new perspective into the decision-making process, influences, and influencers. Their digital ethnographic analysis was effective in providing insights to the client that helped change their view of the customer experience, and helped inform a new approach to engaging and working with their customers, and gave agency back to the customer, as well as provide an urgency for action.